Roscoe Village is a restored Ohio and Erie Canal town operated by the non-profit Montgomery Foundation. It is a free, educational, and entertaining place to take your family for a summer outing. With an old time general store, a craftsman's shop, and more, you will find yourself transported from the time you step foot on the main thoroughfare to an era that has passed. 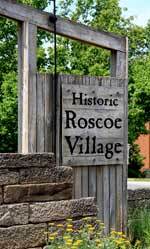 If you are looking for more entertainment though, you can find it during any one of Roscoe's popular special event weekends of which there are plenty. Dulcimer Days: Historic Roscoe Village salutes dulcimer music at its annual Dulcimer Days festival and competition. The festival, hosted by Roscoe Village, is held at the nearby Coshocton Lake Park Pavilion and will feature the Mid-Eastern Regional Hammered and Mountain Dulcimer Championships. Dulcimer Days is the oldest dulcimer festival in Ohio and the second longest running festival in the world. Guests will participate in hammered and mountain dulcimer, harp and bowed psaltery workshops; open, vocal, and duet contests; and a Saturday evening concert featuring two prominent dulcimer musicians. Approximately 1,400 guests are expected to attend Dulcimer Days with more than 70 contestants participating in a variety of dulcimer competitions throughout the weekend. Corvette Cruise-In: Over 300 corvettes will converge on Roscoe Village at this event hosted by the Classic Glass Corvette Club. Stroll through the streets of Roscoe Village to the tunes of 50’s and 60’s music as you admire your favorite car and talk to its proud owner. Heritage Craft & Olde Time Music Festival: Experience the rich heritage of Roscoe Village and its surrounding area through the sights, sounds, and traditional crafts of the 1800s. Watch the blacksmith’s anvil ring, the weaver spinning wool, and the demonstrations of heritage crafters selling their traditional handmade wares. Listen as the sounds of bluegrass, dulcimer, and old-time music drift through the air and the strings of the fiddle lure you in. Hone your musical skills by participating in the hammered dulcimer, fiddle, guitar, and dance workshops, or let your competitive side show as you compete in the flat-pick guitar contest. 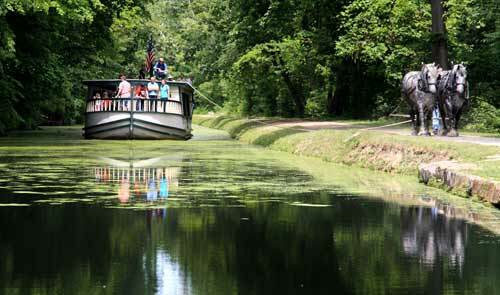 In addition to hosting a display by the Coshocton Art Guild, Roscoe has captured the true essence of canal heritage, and every guest can experience one special weekend filled with music, traditional crafters, jam sessions, and art exhibits. Civil War Reenactment: Experience the drama of the War Between the States as Historic Roscoe Village becomes a battlefield. Guests are invited to stroll through the camps, talk with living historians, listen to the music of the era, share a campfire, and experience a soldier's way of life first-hand as he prepares for battle. The weekend will include military skirmishes and drills, medical scenarios, speeches by President Abraham Lincoln, a military car, camp laundress, night fire, educational presentations, children’s activities, and more. Coshocton Canal Festival: Commemorating the landing of the first canal boat, the Monticello, at Port Roscoe on August 21, 1830, the Coshocton Canal Festival features an invitational craft festival; a Grande Parade; a Children’s Pedal Tractor Pull; traditional craft demonstrators; living historians; contests for all ages; food booths; canal boat rides; a fiddle contest; and bluegrass entertainment. Fall Garden Fair: This one-day event features many activities to interest the novice or avid gardener! A select group of garden and craft vendors will be set up on the sidewalks of Roscoe Village along with a Question & Answer booth manned by Coshocton County’s Master Gardeners. Guests can stroll through the gardens of Roscoe Village or take part in a ‘Park & Walk’ tour of private gardens above Roscoe Village. A plant sale, guest speaker, kid’s activities, and garden art complete the events when we present the second Fall Garden Fair! 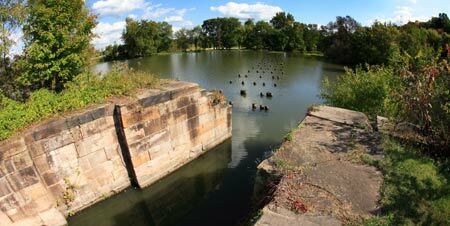 A little further out on SR 36, you'll find the remains of canal locks along with a parking area.